There are a number of different foods that can contribute to heartburn and acid reflux. While they are both uncomfortable conditions, there are also medical reasons for reducing their incidences. For example, repeated episodes of acid reflux can lead to irritation of the esophagus and, eventually, make a person susceptible to cancer. Fortunately, there are different lifestyle and dietary changes that can help stop these issues almost before they even start. While spices tend to add a great deal of flavor and, sometimes, heat, to a dish, they can also be irritating. For people who find themselves suffering from heartburn and acid reflux after eating a spicy meal, try choosing some soothing herbs to season the dish next time. 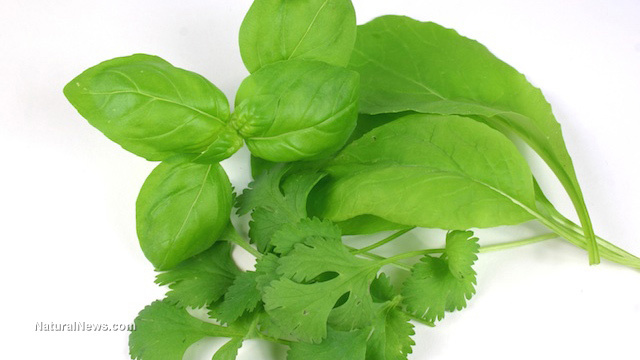 Basil, parsley and oregano are herbs that still add a wallop of great flavor, but are calming to the body. Try to eat more calming and soothing herbs rather than spicy meals. Mint, while an herb that has lots of health benefits, can still irritate those people who are sensitive. Some trial and error might be necessary to determine if an herb can be tolerated. Delightfully fizzy and lots of fun, carbonation also contributes to bloating and gas in individuals who are particularly sensitive to its effects. In addition, it can cause irritation of the esophagus and heartburn. Instead of reaching for a soda or other carbonated beverage, herbal tea and plain water are better bets. Getting the day started with a brisk cup of coffee has become the preferred way for many people to wake up. Unfortunately for java lovers, caffeine can irritate both the esophagus and the intestines, which can lead to acid reflux and heartburn. Instead, warm some almond milk before sprinkling it with cinnamon or try a cup of soothing herbal tea in the morning. Even those individuals who try to eat in a healthy manner may find themselves puzzling over the fact that they are suffering from heartburn and acid reflux. Some very healthy foods, such as tomatoes, beans, peppers, legumes and peanuts, can contribute to heartburn and acid reflux. Other healthy foods, however, can help soothe the stomach and the esophagus. These include oats, olive oil, organic yogurt, berries, leafy greens, apple cider vinegar and sweet potatoes. By eliminating those healthy foods that cause problems, as well as refined flour, red meat, sweets and many dairy products, and substituting with healthy foods that are more soothing, heartburn and acid reflux can be reduced. Simply by following the above tips at each meal, individuals who find themselves suffering from heartburn and acid reflux can find relief in just a short time.